Once home to John Steinbeck, Thomas Mann, and other celebrated writers and artists, The Renwick Hotel, a historic property in the heart of midtown Manhattan, is part of Curio – A Collection by Hilton. 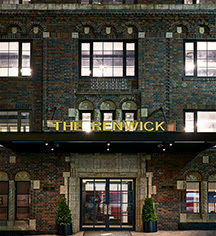 As the first New York City hotel to join Curio’s global set of remarkable upscale properties, The Renwick facilitates travelers’ desire for unique discovery and authentic experiences. Housed in an iconic 1920s brick building, The Renwick Hotel New York City, Curio Collection by Hilton is located just two blocks from Grand Central Station and a short walk to Bryant Park, the New York Public Library, and bustling Times Square. 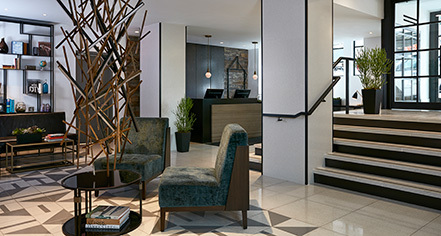 Complete with 173 guestrooms and suites, the fully-renovated property takes inspiration from its days as a residence for intellectuals and literati, with unique interiors designed to pay homage to culture and art from the Roaring Twenties. The Renwick Hotel New York City, a member of Historic Hotels Worldwide since 2016, dates back to 1928. The building formerly housed oversized studios and lofts for celebrated artists, writers, and creators including authors John Steinbeck and F. Scott Fitzgerald. Parking: Valet parking fee: $55.00 per day. Once home to John Steinbeck, Thomas Mann, and other celebrated writers and artists, The Renwick Hotel, a historic property in the heart of midtown Manhattan, is part of Curio – A Collection by Hilton. Learn more about the History of The Renwick Hotel New York City, Curio Collection by Hilton .